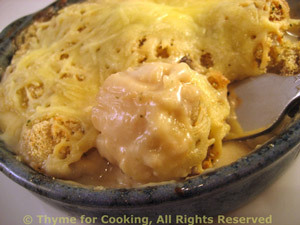 Coquilles Saint-Jacques, gourmet New Year's Eve dinner. New Year's Eve. If you're not going out, try this lovely dinner with a bottle of Champagne. It's festive, pretty and easy. Phyllo dough can be thawed and re-frozen twice. We are using filo (phyllo) dough to make cups for these little tarts, filled with feta and capers. They could be made smaller, using a small muffin pan, and eaten out of hand. Sauté bacon until crisp. Remove and crumble. Place 2 ramekins, 2 1/2 - 3" (6 - 7cm) on a baking sheet and set aside. Lay out 1 sheet of filo and, using pastry brush, lightly brush all over with olive oil. Fold the sheet in half, lightly brush the top. Fold in half again, the other way, so you have a small square. Brush the top lightly with olive oil. 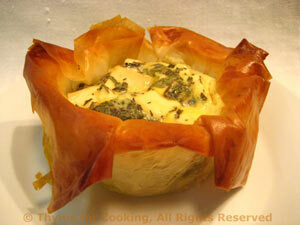 Pick the filo up by bringing all 4 corners together and carefully put inside a ramekin. Smooth out the bottom a bit so it kind of lines the ramekin, leaving the 4 corners to hang over the edge. It should all be rather loose. Repeat with other sheet and ramekin. Divide feta and place in each ramekin. Divide and add capers and bacon. In small bowl whisk together egg, herbs and crème fraiche. Divide egg and pour over cheese, capers, etc. When done remove from oven and carefully remove filo cups from ramekins. Kind of wiggle, then turn upside down into your hand. Serve, garnished with a few olives and/or a bit more feta. Roughly chop pepper, shallots and garlic. While rice cooks: Heat oil in a small skillet. 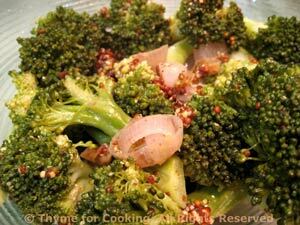 Add shallots, pepper, garlic and sauté until shallots are tender. 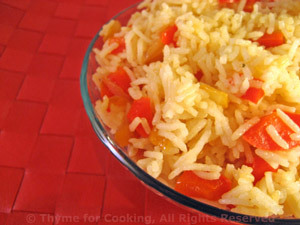 When rice is done fluff with a fork, add shallots, pepper, stir well to combine and serve.